India's last substantial stretch of tropical evergreen rain forests. Perhaps the only vestige of a near virgin forest in the whole of the Western Ghats. Elephants, tigers, wild dogs, flying squirrels, and lion-tailed macaque are found here. One of India's major sanctuaries, this sanctuary in the Western Ghats is a Tiger Reserve. There are lots of other animals - elephant, sambar, Malabar giant squirrel, gaur, stripe-necked mongoose wild boar and over 260 species of birds including Nilgiri wood pigeon and the purple headed parakeet. This bird sanctuary is a peninsular land of 25 sq km formed between the banks of River Periyar. The river is rich in fish life. The avifauna includes both resting indigenous birds and water birds. The most notable indigenous birds are Malabar grey hornbill, Grey Jungle fowl, heron, Jungle Mynah, woodpecker and the rose-winged and blue-winged parakeet. Rare birds like Ceylon Frog Mouth and the rose-billed roller are also seen. Spread around three dams, this sanctuary is home to macaques, langurs, wild boars, gaurs, spotted deers, common otter, tigers, leopards, sambars, crocodiles and elephants. You can observe these from the watchtowers erected by the Forest Department. The 97 sq km wild life sanctuary is also known as a National Park, since it has the largest population of Nilgiri Tahr existing in the world. A wide variety of plant life is present here. The popularity known Neelakurinji is one of the rare species that grows here. Anamudi peak, which is 2695 m high, is located in the southern region of this peak. There are different species of animals and birds like barking Deer, Gour, Giant Malabar Squirrel, Tiger, Panther, Wolf, Black Bird, Jungle crow etc. This sanctuary is situated just above the arch dam. An area of 70 sq km of forestland between the Periyar and Cheruthoni rivers provide an excellent habitat for wildlife. Elephants, bisons, bear, wild boar, sambar are some of the animals found here. The lake on three sides of the sanctuary offers a panoramic view. Proximity to Eravikulam National Park and Anamalai Wildlife Sanctuary in Tamil Nadu, make Chinnar rich in wildlife. 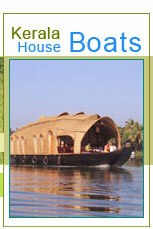 This sanctuary is easily accessible from Udamulpet in Tamilnadu and Munnar in Kerala. The forest type comprises of thorny scrub forests, dry deciduous forests, high altitude sholas and wet mountain grasslands. Elephants, sloth bear, sambar, mouse-deer etc are found in this sanctuary. It is also rich in avifauna and reptiles. 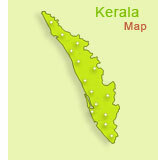 This sanctuary is easily accessible from Kannur. Spread over an area of 53 sq km on the Western Ghats, Peppara is accessible from Vithurai on the Tiruvananthapuram-Ponmudi Road. Dotted with large hills, forests and eucalyptus plantations, this sanctuary with its rich fauna and birds is emerging as a big attraction to wildlife enthusiasts. Elephant, Sambar, leopard, lion-tailed macaque are found here. The Neyyar reservoir is easily navigable and extends up to 9 sq km. The vegetation varies from tropical wet evergreen to grasslands. Agasthyakoodam, 1890 m high, is in this sanctuary. Elephant, Gaur, Sloth Bear, Nilgiri Tahr, Jungle cat, Wild Boar, Nilgiri Langur etc.are seen. A crocodile rearing centre, deer farm and lion safari park are the main attractions near the dam site. The sanctuary, which is spread over a cluster of islands, covers an area of 3 kms in a scenic area surrounded by hillocks. A hillock, which is 200 m above sea level, provides a splendid view of the river mouth and the sea. situated on the banks of the Vembanand Lake is known for its varied avian population. Local varieties such as waterfowls, cuckoos and owls, as well as the migratory Siberian Cranes can be viewed here.Boats are available on hire for a a cruise around the sanctuary.